Until the most recent Nikon D5 camera, photographers could not use a radio signal to trigger a flash placed in a remote location without getting a third party product. Just about everyone uses the PocketWizard. Now there is an upgrade to the PocketWizard—the FlexTT5 Transceiver Radio Slave. Even before the new Nikon line and before the PocketWizard, it was possible to use two flash units in a master/slave relationship and place one of the flash units closer to the subject then then camera. However, it was necessary to be in the line of sight in order to trigger the flash. The signal was infrared, so the sender and the receiver had to be in the line of sight with each other to work. Third Party manufacturers came along with options to change that by using a radio frequency that freed the photographer from the restrictions of line of sight placement of secondary flash units. With a radio triggered flash devise like the PocketWizard you could hide your flash unit behind objects or you could place it in a concealed location and it will work. Radio signals do not need to be in line of sight. 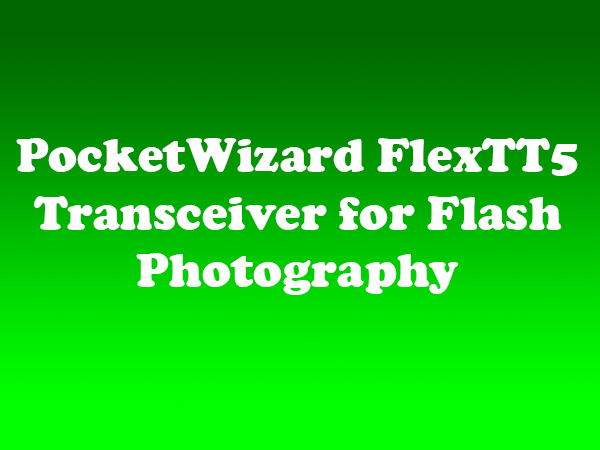 The latest transceiver from PocketWizard is designed exclusively for the Nikon i-TTL flash control system and excels at both triggering a remote camera and firing remote flashes. When combined with the PocketWizard MiniTT1 Transmitter or another FlexTT5, photographers can operate completely wirelessly. Transmitter and Receiver Capabilities: Auto-Sensing Transceiver technology enables the FlexTT5 Transceiver to automatically switch between transmit mode and receive mode. Auto-Relay Mode: The feature allows photographers to trigger a remote camera in sync with distant remote flashes. standard channels for manual flash photography. Channels can be configured via the PocketWizard utility or the Learn function. Zone Control: With the addition of an AC3 ZoneController on top of the FlexTT5, photographers can control up to three zones from the camera’s position. Built-in Hot Shoe: The feature allows photographers to combine their remote flash with on-camera flash or use the on-camera flash for additional CLS / i-TTL or Manual Power Control only. HyperSync: The technology allows photographers to achieve faster X-sync speeds, sometimes up to 1/8000 of a second, with full power flash. Low-Profile Design: The FlexTT5 lies flat, stays out of the way and features a flip-up antenna for additional range when needed. With regard to functionality, the FlexTT5 is extremely easy to use. It takes just minutes to set up, sliding directly into the camera’s hot shoe. As promised, it delivers reliable shots around corners, out of sight and in bright sunlight. The PocketWizard FlexTT5 retails for $186 and is compatible with all other PocketWizard radios, even models dating back several years.